Did you know that table tennis originated in England in the late 19th century as an after dinner game? The dining room table was cleared, a row of books was laid down the middle to form the "net", and more books, or the lids of cigar boxes, were used as "bats"! The game became so popular that companies began to manufacture proper bats, balls, nets and tables. The game was commonly nicknamed "wiff waff" or "ping pong" because of the noise the ball made against the bats. Table tennis can be played with two or four players, and is a Summer Olympics sport. Since 2011 there has been an World Championship of Ping Pong, also known as the WCPP. In 2016 the event will take place at Alexandra Palace in London over three nights, from 22nd January to 24th January, and 64 table tennis players from all over the world will be competing against the defending champion, Andrew Baggaley of England! It sounds like an awfully good excuse to explore our ping pong / table tennis activities! There are really two activities here. Get your pencils out and write something great about table tennis on the writing page, then, if you are using the black and white version, colour in the picture! 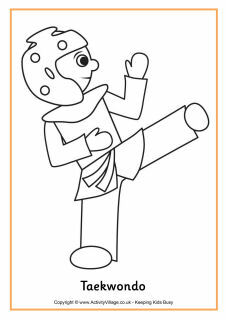 Here's a simple table tennis colouring page for younger kids. The player is wearing Team GB kit from the London 2012 Olympic Games. Here's a fun way to get some handwriting practise in! Kids can trace the words "table tennis" until they get confident, then try to write it on their own. Here is our table tennis illustration in poster form, to print and display or use in projects. Kids can use our table tennis story paper for writing about the sport or making up a story. Available with lines or handwriting lines, and of course there is a picture to colour in, too. There's space to draw a bat and ball on this table tennis writing prompt, and then you can write why you love table tennis on the lines on the right.